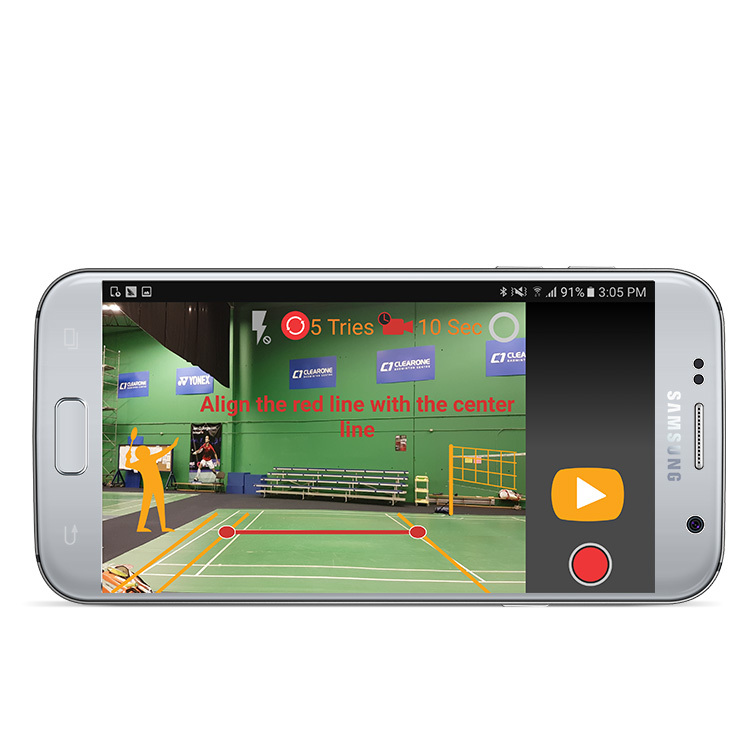 Our newest project, the Shuttle Speed app, allows players to measure the speed of a badminton shuttle by using just a smartphone or a tablet – no high speed cameras, radars or lasers required! This lets players find out how fast their smash is. Compare your smash speeds against friends, see your rankings in your country, and find out how you place worldwide! Shuttle Speed uses image processing techniques to capture the shuttle flight path. Most cell phone or tablet cameras capture about 30/60 frames per second, and the shuttle path appears as a streak in photos. Our engineers call these “contours”. Device cameras are typically capable of recording 2-4 contours before the shuttle crosses the net and leaves the camera frame. The Shuttle Speed app calculates the speed of your smash from each of these captured contours. As the shuttle slows down, the speed decreases with each contour. This change in speed is used to fit into our shuttle flight model which can calculate the shuttle speed at both the beginning and the end of the smash. How accurate is the LingBu Shuttle Speed app? The measured speed depends on a number of factors, including the frame rate of the device camera, the resolution of the camera, the steadiness of the camera, the contrast of the shuttle to the background, and the interference of moving objects in the background. In general, for a clean background and cell phone that is on our recommended list, we can achieve a 95% accuracy compared to a high speed camera that captures at at 1000 frames per second. What type of cell phone or devices can I use? LingBu Shuttle Speed app is only available for Android devices at the moment. For the device camera, the Shuttle Speed app requires resolutions to be 720P or higher, and a frame rate of at least 30fps. We are working hard to expand the set of compatible Android devices and to develop Shuttle Speed for iOS. How can I improve the accuracy of my measured speed? Accuracy is at its best when using a device on the recommended list. A clean background without other movements will further enhance accuracy. Cell phone mounted on a tripod will also improve accuracy. Make sure there is enough colour contrast between the wall and the shuttle. LingBu Shuttle app uses many algorithms to detect errors and estimates speed. Any improvement mentioned above will enhance speed accuracy. What is the top speed that the Shuttle Speed app can measure? The app can measure shuttle speeds of up to 500 km/hr. The world record for the fastest smash is around 400 km/hr, so we’re well within the range. What’s the difference the free and the paid version of the app? The free download allows for 3 successful recordings so you can try out the app and make sure Shuttle Speed works in your badminton facility. The paid version allows for unlimited speed recording and access to ‘Advanced Processing’. I have further questions or suggestions. How do I contact LingBu? There will be times when the Shuttle Speed app fails to detect the speed of the shuttle. Here are some tips with help you improve shuttle tracking. A big thank you to our Indiegogo supporters: Mohd Hidzer Cha, Chai Kheng Seng, clarezoe, Choy Jun Kiet, Tuan M Le, Kah Heng Gan, Isaac, Tiung Sok Mui, Rosalynn H Chong, Curtis Stensland, and Noah Wang.